Henry – Available for Adoption! Likes: Squeaky toys, treats and playing with his foster brothers and sisters! My name is Henry. I’m about 1 years old. My foster mom thinks that I am the best pug ever. When she’s home I seldom leave her side. With new people, I tend to be standoffish for awhile especially if my mom isn’t around. I love playing with the other dogs in the house and the human kids too. Car rides and going for walks are probably my two favorite things. I have a big back yard that I can run around and I like that too. I occasionally might have an accident in the house of mom doesn’t open the door for me. I need lubricating eye drop every morning and especially at night because my eyes get kinda dry. Interested in adopting Henry? 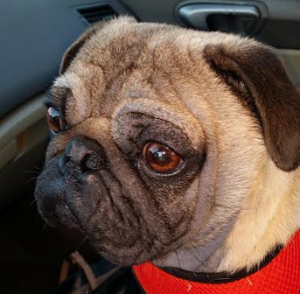 Please see our website and fill out an application at: www.pugpartners.com/adoption-application Henry’s minimum adoption donation is $400.